Does Your Child Have an Anxiety Disorder? Does Your Child Have An Anxiety Disorder? originally appeared on Babble.com. Jan knew she couldn’t be late for work again, but her daughter Emily was making it increasingly difficult to get out the door on time. The 6-year-old simply did not want to go to school. Breakfast had become an ordeal and Emily frequently complained that she had a stomachache. She was missing the bus several days a week, and driving her to school was making Jan late. Emily would cling tightly to her mother’s arm and beg to go home as Jan practically dragged her to class. “Honey, you’ll be OK,” Jan would tell Emily. “I know you love Mrs. Hernandez and have lots of friends here. Everything will be just fine.” As she pulled out of the parking lot, she felt guilty about leaving her daughter in an obvious state of distress. But what else could she do? Emily had been anxious for a long time. As an infant, she had struggled to connect with caregivers. As she got older, Emily insisted on sleeping with a light on and she often had trouble falling asleep unless Jan was with her. She followed her mother everywhere and Jan was concerned. 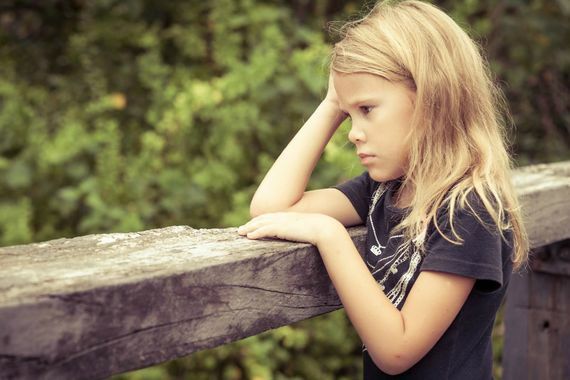 Anxiety is our response to danger, real or imagined, and if your child has persistent worries about things that don’t seem like rational concerns, it could be a sign of an underlying anxiety disorder. About one in eight children have characteristics of anxiety, and separation anxiety is the most common form in young children. Girls are twice as likely to have it as boys. Related: How do I know if my child has ADHD? The hard part is figuring out if your child’s fears are part of typical development or something more. Children don’t always have the words to express how they feel and why, or have the ability to assess a fearful situation and accept help to resolve it. If your child appears to have ongoing, persistent anxious behaviors, and the distress is keeping him from participating in normal activities, it might be time to learn more. 1. Don’t feel that you have to take away the fear. As parents, it’s impossible to prevent our children from feeling afraid. We can empathize, and validate their feelings, but should not try to persuade them to feel differently. Let your child know you will help him or her manage the anxiety. Because she had no other tools to use, Emily’s response to fear was avoidance. With the teacher’s help, Emily now calls her mom twice a day. She is encouraged to share one thing she has done so far, and what she will do until they talk later. 3. Help your child recognize the anxiety. Understanding what is going on with your body can go a long way toward alleviating stress, and knowing the signs of anxiety can be helpful. Jan helped Emily understand that a stomachache, feeling worried about being alone, or being afraid to go to sleep are warning signs. 4. Teach your child a strategy to help her calm down. Jan taught Emily the three Ss. STOP what you are doing, SIT down, and exhale by saying SH-SH-SH-SH. Repeat this three times. It’s a simple strategy that can be used anywhere to help your child calm down. 5. Develop a list of support behaviors. Jan and Emily came up with replacement activities Emily can use to help manage her anxiety. For example, wrapping her mom’s robe around herself for comfort at night to feel like a hug, and taking small sips of water to help her settle down when her stomach hurts. 6. Reward your child’s efforts. As your child starts to use new strategies to manage his anxiety, it’s important to provide immediate reinforcement. At school, Emily uses a timer to limit the length of her calls with her mom and is rewarded by the teacher with “points” when the call ends on time. At the end of the week, Emily uses her points for a special reward. While mild anxieties and fears are common in childhood, these can become a more serious concern when daily life is interrupted and kids are in distress. There is no “right” way to respond, but untreated anxiety disorders can put children at greater risk for more serious behavioral and health problems later. Don’t hesitate to speak with your pediatrician if you have concerns. For helpful information about anxiety disorders in children, visit the websites of the National Institute of Mental Health (www.nimh.nih.gov ), the Substance Abuse and Mental Health Services Administration (www.samhsa.gov) and the American Academy of Pediatrics (www.aap.org). Read more here:: Does Your Child Have an Anxiety Disorder?